Imperva Part 3 - Hybrid Cloud – What it is & How Do You Secure It? The advantages offered by a cloud-based environment makes it an easy decision for most companies to have apps and data both on-premises and in the cloud. Still, there are numerous critical choices to be made that can transform the complexities of the migration process into a relatively smooth transition—especially regarding application and data security. 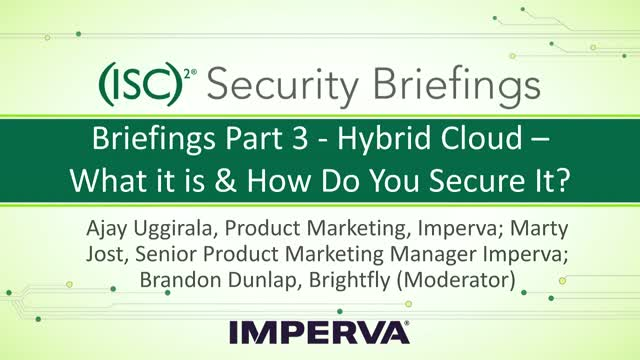 Join Imperva and (ISC)2 on April 5, 2018 at 1:00PM Eastern as we define the hybrid cloud and talk about best practices to secure your company assets as you start managing and securing them both on-premises and in the cloud. Title: Imperva Part 3 - Hybrid Cloud – What it is & How Do You Secure It?